2014. By Robert W. Audretsch and. Sharon E. Hunt. A great new illustrated history of the Depression-era CCC in Arizona. 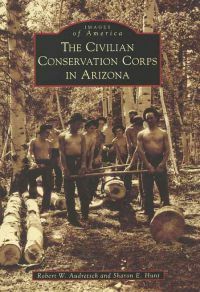 Filled with more than 190 images and illustrations depciting the Corps' work in places such as Petrified Forest National Park, Grand Canyon National Park, and South Mountain Park. Softcover. 128 pp.